Philip Lewis Powell was born on a Tuesday, January the 10th, 1939, to Stanley Lewis and Mildred Mary Powell at home in a small village called Itton in South Wales. Itton, near the Welsh/English border is a place of rolling hills, a lordly home with a famously white pack of hunt hounds and of farming. My dad was born into a farming family. This family included his older sister Ruth and younger brother David. My Father’s Grandfather was also a farmer. Dad’s early years were characterised by frequent moves as Grandfather Stanley worked on farms owned by others as well as conducting a lay ministry, a ministry ably and actively contributed to by Grandma Mildred. The moves were contained within the same Welsh English border area as Dad’s birth. So went the first decade of Dad’s life, until by the coincidence of an uncanny accident that compromised Grandad’s capacity to farm, a chance meeting with an old acquaintance there resulted in an invitation from the Assemblies of God denomination in New Zealand. The family of five, with Dad aged 12, packed their bags, and not much else, and got on a steamer bound for the Antipodes. The year was 1951. Grandad became a church pioneer on the other side of the planet. Church pioneers are movers and so the family ministry commenced in Wellington, then moved to Te Awamutu, and onto Lower Hutt, then onto Palmerston North. Dad always had an easy capacity with school work and thrived with learning. Feeling a distinct call to Ministry, Dad flew the coop and departed for Bible College in Brisbane Australia in May 1957, aged 18. Two and half years later, Dad graduated Dux of college, with a great respect for his principal, James Wallace. I recall many occasions that Dad spoke of this man. Returning to New Zealand, Dad committed to a year of working to save money for a return visit to the United Kingdom, with his sister Ruth. In this year Dad’s 21st Birthday was also celebrated. Philip and Ruth boarded a steamer heading north, via the Suez for the Old Country, thinking they would be away for a year. Much to Philip and Ruth’s surprise, the rest of the family chose their absence to take on a bout of homesickness that resulted in the decision to pack-up in New Zealand and follow along. In the year 1961 the whole family was back in the UK. A decision with obvious and clear ramifications for the family in general, and certainly for myself and my siblings, and indeed for all of our children as well, as it precipitated Dad staying in the UK for much longer than otherwise likely. 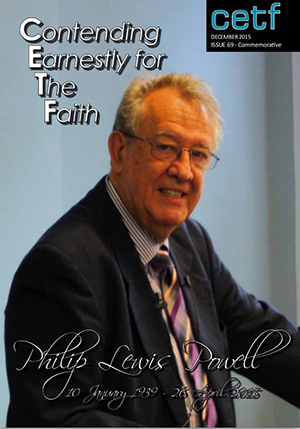 It ensued that my Father’s ministry was founded in the United Kingdom, initially influenced by Grandad’s brother, Uncle David, but also surely nurtured by another brother of my Grandfather’s called Stephen. Both, like Grandfather Stanley, were true men but all with very different character; Grandad, as modest and earthed as a man can be, Uncle Steve as calm and nurturing, and Uncle David of great bearing and resoluteness of mind. In this period, a great tragedy happened to the family. Dad’s younger brother David died in an accident. This was a time in which faith was tested but never quashed. In the short period after the tragedy, Dad’s parents and sister returned to New Zealand to live. Dad was in his first solo pastoral ministry in Manchester, fostering and growing a church called Bethel. His energies through the sixteen years he ministered here were also directed to missionary work in Europe, preaching in the US, a Holy Land tour, some preaching in Australia and New Zealand and, very significantly, the founding of a pamphleting and printing press ministry that he maintained in varying forms throughout his life. His last blog output was barely a few weeks ago. Two other lifelong formations occurred at this time. One was the friendship formed with another Welsh born minister in Manchester. This friendship with Aeron Morgan endured for life, on both sides of the planet. We note with great appreciation the presence today of Aeron’s wife Dinah, and other members of his family. Aeron’s great friendship in Manchester was a particularly timely occurrence... because Dad was going to need a Best Man. Dad met my mother, Kathleen Kidd and married the Mancunian student nurse on July 30th, 1966. It was a day of enormous celebration throughout the United Kingdom, the scale of which had not been seen since the end of the Second World War. Indeed, it was the day that England beat Germany in the World Cup Final, at Wembley Stadium. For the stoic folk of Northern England it was a wedding celebration at which more than the usual number of tears were shed, especially by the men. This marriage was the beginning of a great and life lasting love, but also a collaboration of work in the church that was a meeting of equals in steadfastness, energy and service that will be equalled by few. My Mum has been a great support and tireless crusader; easily the equal of my father in what may often seem “His work”. Mum you are a wonder. My father was fortunate to have had you as his great earthly treasure. Children were born; myself, Stephen Lewis in 1969, David Philip in 1970 and Amanda Louise in 1972. We were brought up in busy times, with great love, care and attention from our mother, and great love from our father. Our extended family included Mum’s parents, Nana and Grandad Kidd, and Mum’s Sister and Her family, Aunty Sheila, Uncle Chris and cousins, Stephanie and Joanne. They were constants in our lives, and all were included in assisting with the great workload of Dad’s energetic ministry. Great Aunts and Uncles were many, as were Aunts and Uncles that were honorary as part of a Church community that ensured we had many large lunch gatherings as part of already crowded Sundays. Holidays were generally to be had around Dad’s preaching. The landscapes were those of Wales from a time of Castles and Knights, or sometimes southern counties like Cornwall and Devon, where Mum and Dad had honeymooned, places that seemed to speak more of Famous Five adventures. Dad’s work with conferences and writing and ministering and pastoral work were always nearby, but always he was caring and giving to the family. We were blessed with an extended stay from Dad’s parents who had returned to New Zealand before our births. Same of Dad’s Sister, her Husband Darrell and their five boys, David, Craig, Dean, Glenn and Andrew. Great times and fun as the twelve of us lived in a three bedroom, one bathroom house plus a caravan that seemed to offer at least some shelter from the less than benign weather Manchester is famous for. We laugh at tales of how that shelter was perhaps less evi- dent to those sleeping within. The trips around the United Kingdom escalated in the year of 1978 as we prepared and said goodbyes to start our own family’s trip to the southern hemisphere and this land Australia. Five weeks of preaching and touring through the United States, nearly three weeks in New Zealand and on November the Thirteenth, 1978 we landed in Sydney for the start of our journey to becoming Australian. Dad pastored the Bible College church in Katoomba, working together with Aeron Morgan, and then two years later accepting the position as Pastor of the Living Waters Church in Kyabram; Victoria. Here the missionary focus shifted to India, itinerate ministry continued to the UK and the US, and we were immersed in the very particular culture of Australian small country towns. In Kyabram, Dad honed his sermon making, forging his great extrapolated sermon series, including those about Elijah and Elisha, and most famously, the 23rd Psalm series in which, “A day in the Life of Sheep” was expounded upon over about six weeks. At this time Dad also managed to provoke a couple of controversies locally including challenging the school we attended regarding curriculum and reading matter choices. Dad pastored the church in Kyabram for eight years. It was here that we were blessed with the arrival of our dear baby brother Jonathan James. Our family of five became a family of six. He has been a great source of happiness for us all, and a great boon to my parents through the second half of life. He was born in 1986, the year that I completed my final year of high school, and left home to further my studies in Melbourne.